A report from the chairman of the remuneration committee that sets out the context for remuneration consideration and decisions as well as an outline of the material matters considered during the year. The remuneration policy and framework to be tabled at the AGM for a non-binding vote by shareholders. The implementation of the remuneration policy to be tabled at the AGM for a separate non-binding vote by shareholders. As required by the Companies Act, non-executive directors' fees for the financial year ending 30 September 2019 will be put to shareholders by way of a special resolution. We have retained the comprehensive version on the website at http://www.nampak.com/Content/Documents/About/remunerationreport-2018.pdf to assist with any detailed information around share plan implementation which may be required. For details of the composition of the committee and attendance at meetings, please refer to Ensuring good corporate governance. Nampak's remuneration is designed to facilitate delivery of the group's strategy on a sustainable basis and to deliver value for stakeholders over the short, medium and long term. This report provides details of our remuneration policy and framework as it relates to our employees, group executive committee members, executive directors and non-executive directors. It also includes our implementation report for executive directors, group executive committee members and non-executive directors. In February 2018, for the first time, we did not receive the required number of votes in favour of the remuneration policy and the implementation report. Retention bonus payments to CEO and CFO Concerns were raised that the retention bonus payments were outside of our remuneration philosophy and policies and this resulted in many shareholders and proxy advisers voting against both the remuneration policy and implementation resolutions at the AGM The chairman of the remuneration committee has engaged extensively on this issue and has provided details behind the decision of the remuneration committee. At the end of 2017, there were very limited retention mechanisms and the company was at risk of losing its two most senior executives who understood the business requirements and were critical to resolving key material matters in the short term. The retention structure was deemed to be most appropriate under the circumstances. The committee will consult proactively and seek prior approval for any future material changes of this nature. No such payments to the chief executive officer and the chief financial officer were approved in 2018. 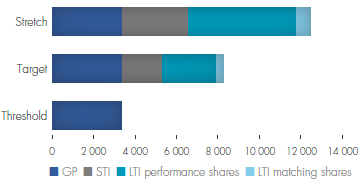 Lack of performance conditions attached to matching award under the deferred bonus plan Concern was raised, particularly by offshore proxy advisers, that there were no performance conditions linked to the release of matching share awards in terms of the deferred bonus plan The after-tax short-term incentive (STI) is voluntarily invested in shares to encourage share ownership and the matching shares further facilitate ownership. 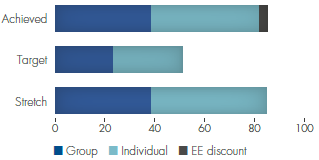 In order to participate in the deferred bonus plan, participants needed to have earned a short-term incentive which would have been subject to performance conditions and the deferred bonus plan structure had been introduced largely as a retention component and to encourage executives to build a shareholding in our company. The committee agreed to review this position annually. For the overall weighting in the remuneration structure, please refer to the remuneration mix. Certain executives received retirement gratuities The payments were made in terms of a legacy policy entitlement which had been capped at R500 000 and which was subsequently closed to executives appointed after December 2013 The remuneration committee agreed to provide more detailed disclosure in the 2018 remuneration report. We encourage all shareholders to provide feedback and contributions regarding their position on the various voting requirements. We therefore invite shareholders wishing to engage with the chairman of the remuneration committee to do so via email at corporategovernance@nampak.com. Should we receive 25 percent dissenting vote for either the remuneration policy or the implementation report, or both, we will include an outline of the process and timing of our proposed engagement with shareholders to resolve unsatisfactory results in the SENS announcement of the voting results of the AGM. Together with input obtained from shareholders and proxy advisers during the year, we have considered it prudent to retain the current policy, target structures and frameworks with some minor adjustments to individual performance conditions in the short-term incentive plan (STI). 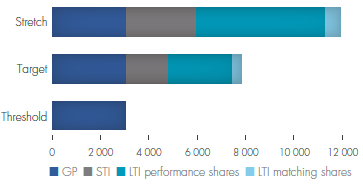 In the past, the STI has been slanted towards financial performance measures with a smaller portion linked towards other economic, social, environmental and governance requirements. During the year, the focus has shifted to identify and include more key drivers of sustainable profitability and this trend will continue into 2019. The committee attended to all activities set out in its charter and the annual committee work plan during the year. The committee charter is available on the website at http://www.nampak.com/Content/Documents/About/remuneration-committee-charter.pdf. Engagement with shareholders and proxy advisers continued in order for the committee members to understand and discuss the material issues on the remuneration policy and framework and implementation report with the board. The committee implemented the change to a more simplified share plan structure consisting of two plans, namely the performance share plan and deferred bonus plan for executive directors and group executive committee members. The overall benchmark remuneration for on-target performance remained. Participation in the share appreciation plan has been retained for senior management levels that do not receive any awards under the other share plans as a mechanism to attract, motivate and retain the appropriate calibre of talent and diversity. The overall annual increases for executive director and group executive committee members amounted to 5.5% and remained below the average annual increases granted to other staff. This is in line with our objective to improve wages and the socio-economic conditions of our lower level workers. The group headline earnings per share target linked to the STI was fully achieved resulting in this portion of the incentive bonus being released. Various levels of EBITDA adjusted for interest, trading income and key performance objectives were achieved and these are reflected in the incentives earned by the operational and support executives. These levels of achievement are consistently reflected in other managerial STI payments. The performance conditions aligned to the performance share plan and share appreciation plan were not achieved and as a result none of the December 2015 awards will vest. The actual earnings reported under section three of this document reflect the levels of achievement against the performance targets at executive director and group executive committee levels. Approved the guaranteed packages for executive directors and group executives. Approved the terms and conditions of the executive directors. Approved the STI payments for executive directors and group executives after considering achievement against performance conditions. Approved the LTI awards for all participants and determined the performance conditions. Reviewed the defined benefits liability strategy and implementation against plans. Reviewed the fee recommendations for non-executive directors and committee fees, excluding the fees for the remuneration committee before submission to the board for consideration. 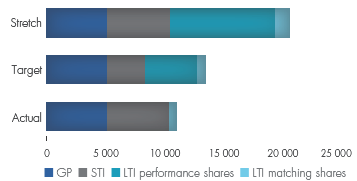 The committee considers the financial performance conditions and targets for the STI and LTI plans annually to ensure that they are relevant and fair to the different stakeholder groups. In light of lower GDP growth rates, declining inflation and increasing unemployment depressing consumer demand, together with benchmark data, the committee approved changes to the 2019 targets. These changes are reflected in the Elements of remuneration and policy table of this report. The committee considers the revised targets to be prudent and yet still provide alignment between executive remuneration and shareholder experience. The committee has requested a review of its equality in income distribution position and a wage gap analysis for our continuing operations in order to manage fair and responsible remuneration including the wage gap and any gender pay disparities more comprehensively. Current basic salary and benefit levels for non-managerial employees exceed the industry norms by some margin which contributes to a stronger gini-coefficient for the company versus industry norms. In addition, retirement, insured benefits and voluntary medical aid membership remain an integral part of the remuneration structures of the vast majority of our employees. 1 PM Surgey resigned on 10 October 2018. RC Andersen appointed on 10 October 2018. Our remuneration policy at executive level remains largely unchanged from previous years and continues to focus on delivery of financial and non-financial measures that underpin the group's strategy and sustainable profitability objectives. The components of the remuneration structures applicable to other managerial and non-managerial employees are set out in the Elements of remuneration and policy table of this report. The balance of the report is focused on executive director and group executive remuneration policy and frameworks and this is also the case for the implementation report. The remuneration structure for executive directors and group executive committee members has been designed to reward consistent improvements in short- and medium-term sustainable profitability which underpin value creation for shareholders. Guaranteed packages are generally clustered at the median of the benchmark. 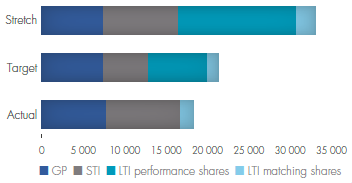 There is a larger weighting towards at-risk or variable pay components which are provided in the form of an annual short-term incentive (STI) and longer-term share plans (LTI) participation. Challenging performance conditions that are aligned with shareholder requirements and expectations are set and must be achieved for earnings to accrue to participants. If these targets are achieved, upper quartile remuneration should be delivered from the variable pay structure for executive directors, group executive committee members and certain senior managers. 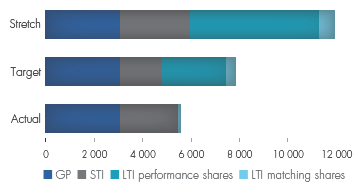 For purposes of illustration below, 60% of maximum is assumed to represent threshold performance and target reflects full achievement for both the STI and LTI components. The remuneration structures for executive directors and group executive committee members have been designed to encourage sustainable profitability on a consistent basis. This has been achieved by consistent application of appropriate financial targets linked to the STI and LTI components. The social, environmental and governance performance will ultimately reflect in consistent financial performance over the long term. 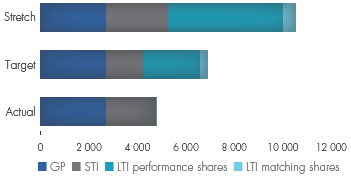 Therefore, and in order to ensure the self-funding nature of STI and LTI remuneration structures, the performance targets are more heavily weighted towards quantitative achievements. management of governance and ethics. The LTI elements provide the board with a tool to attract and retain the right calibre of executives. The performance targets are set over three-year performance periods and require consistent achievement of challenging financial performance conditions. Experience of executives is aligned with that of shareholders as once vested, the shares are released in three tranches and executive earnings are impacted by movements in the share price and dividends earned. 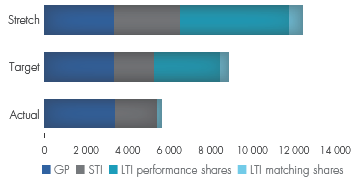 The deferred bonus plan has been included in the LTI components to encourage executives to purchase and hold shares in the company. These shares may only be purchased using proceeds from STI earnings once those performance conditions have been achieved. The chief executive officer and chief financial officer have indefinite service contracts with a six-month notice period. In order to ensure that the notice period remains relevant and necessary, at the end of September each year, the notice period returns to three months. The committee reviewed and agreed the applicable notice period for the next year. The notice periods were renewed for the year ahead. The group human resources director and the other group executive committee members have indefinite service contracts with three-month notice periods. In the event of redundancy, executive directors and other group executive members are entitled to receive payment, in addition to notice pay, in terms of the Nampak redundancy policy. Redundancy pay is calculated based on length of service and age and varies between two weeks and four weeks for every year of service and is calculated using 75% of guaranteed package. The maximum entitlement is capped at 60 weeks. Certain long service executives are entitled to a retirement gratuity from a legacy policy which was capped at R500 000 and then closed to future appointments after December 2013. The executive directors are not entitled to the retirement gratuity, however, certain of the other group executive committee members have retained this capped benefit. The service contracts do not contain any other provisions relating to payments due on termination of employment (for whatsoever reason) or following a change of control of the company. In the event of a change of control, executive share allocations will be dealt with in terms of the rules of the relevant share plans. Further, the directors and executives have no entitlement to a restraint of trade payment and are not entitled to any other material ex-gratia payment. Note 1: The committee may adjust the targets in the event of strategic investment decisions or extraordinary share price volatility. The implementation report details the outcomes of executing the remuneration policy for executive directors and group executive committee members in the current financial year. The remuneration committee has applied the King IVTM recommendation that companies must disclose a single figure of earnings received and receivable for the reporting period. The remuneration committee monitored the implementation of the remuneration policy and is able to confirm that there are no deviations from policy to report. There were no deviations from policy on the contractual terms. There were no terminations at executive director and group executive committee member level during the year. This analysis pertains to South Africa where most of our employees are located. The group exceeded the improvement in headline earnings per share target. There were varying levels of achievement against the divisional financial targets, with some divisions not achieving the required threshold and others achieving 100%. * Reflects differing levels of operational performance. The results of applying the financial and non-financial performance achievements are reflected graphically below against target and stretch levels. A discount was applied for the non-achievement of employment equity targets. Note 1: Share awards will vest in December 2020 to the extent that the performance conditions are achieved. Note 2: Participants receive conditional matching awards in December 2020 provided the participant remains in employment and is still the owner of the purchased shares. The performance targets are set in the Elements of remuneration and policy table of this report. For further information relating to the implementation of LTIs please refer to the full remuneration report available on the website at http://www.nampak.com/Content/Documents/About/remuneration-report-2018.pdf. The chart displays the HEPS which was required for the threshold and stretch achievement levels of this performance condition against the actual achievement. Actual HEPS achieved was 168.7 which was significantly below the threshold HEPS of 262.3 cents and the stretch HEPS of 293.5 cents. The chart displays the cumulative TSR which was required for the threshold and stretch achievement levels of this performance condition against the actual achievement. Actual cumulative TSR achieved was -34.3% which was significantly below the threshold cumulative TSR and the stretch cumulative TSR. The chart displays the RoE which was required for threshold and stretch achievement levels of the performance condition against the actual achievement. The performance condition linked to the share appreciation plan allocations in December 2015 will not be achieved and therefore no awards will be released in December 2018 in respect of these allocations. The chart displays the HEPS which was required for on target achievement of this performance condition against the actual achievement. Actual HEPS achieved was 168.7 which was significantly below the target HEPS of 209.2 cents. 1 Other benefits refer to Group Personal Accident cover. 2 STI disclosed is based on performance during the 2018 financial year, but actual STI payments will only be made in December 2018. 3 LTI disclosed is the award of matching shares under the DBP scheme in December 2017. Values are calculated using market value at purchase date. The performance conditions aligned to the PSP and SAP were not achieved. None of the December 2015 awards will vest. The following table sets out the total remuneration received and receivable by executive directors and group executive committee members for 2017. 2 STI disclosed is based on performance during the 2017 financial year, but actual STI payments were only made in December 2017. 3 MMF Seleoane was appointed with effect from 1 June 2017. 4 FV Tshiqi retired with effect from 30 June 2017. Termination pay comprises a gratuity of R500 000, leave pay of R453 948 and a farewell gift to the value of R7 500. 5 LD Kidd was appointed to the group executive committee with effect from 1 September 2017. Remuneration disclosed is for the full financial year. 6 NP O'Brien retired with effect from 31 August 2017. Termination pay comprises a gratuity of R500 000, leave pay of R533 918 and a farewell gift to the value of R7 500. 7 Cash retention award paid to the group executive – Bevcan in the 2018 financial year in recognition of the performance and contribution made in the 2017 financial year and secures retention. 8 IH van Lochem was appointed to the group executive committee with effect from 1 September 2017. Remuneration disclosed is for the full financial year. 9 LTI disclosed is the award of matching shares under the DBP scheme in December 2016. Values are calculated using market value at purchase date. The performance conditions aligned to the PSP and SAP were not achieved. None of the December 2015 awards will vest. The achievement against target for the remuneration components is set out in the graphs below. Non-executive directors receive a base fee for their services as well as a meeting fee based on their participation in board meetings and other committees. The non-executive directors do not receive incentive bonus payments nor do they participate in any of the executive share plans. Non-executive directors are appointed by rotation in terms of our memorandum of incorporation. The remuneration committee of the board recommends the non-executive fee structures other than for the remuneration committee after obtaining benchmarks from the Deloitte non-executive director report 2018 and specific guidance from PwC regarding market movements and current pay practices. 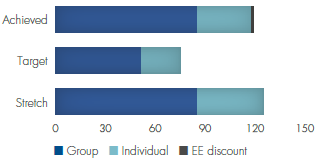 Published non-executive directors' fees and committee fees of companies in manufacturing and companies with similar market capitalisation are also benchmarked. Consideration is given to any changes in the level of complexity of the roles when assessing the fee recommendations. These recommendations are then considered by the remuneration committee (excluding recommendations of their own fees) and the board before being submitted to shareholders for approval in terms of the Companies Act requirements. The non-executive directors' remuneration paid during the year under review (as approved previously by shareholders) and the total comparative figures are disclosed below. Directors' fees are shown excluding VAT where applicable. (2017 including VAT where applicable). 1 Fee includes participation in board meetings and sub-committee meetings. 2 J John took over the chairman role of the audit committee from RC Andersen with effect 2 February 2018 and replaced RC Andersen as ex officio member of the risk and sustainability committee. RC Andersen remained a member of the audit committee. The proposed fees for 2019 are set out in the Notice of annual general meeting. After considering recommendations from management, the board has proposed a 6% increase to non-executive director fees and committee fees. No increase has been proposed for the chairman's fee for 2019.